At one time the "Royal Coconut Coast" was nickname of the entire east coast of the island of Kauai. 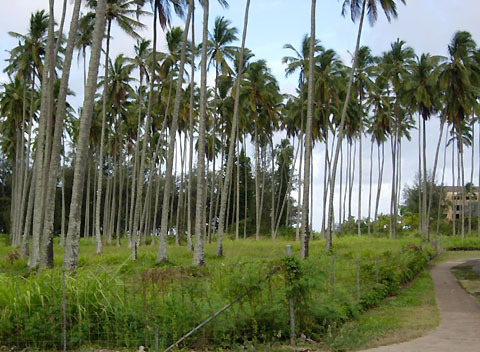 Commercial coconut groves with many thousands of trees stretched from Wailua to Anahola. The first major destination resort on the island, of course, was the Coco Palms in Wailua. When it was built coconut groves stretched from the Wailua River to Kapaa. Today the last stands of the coconut palms that gave the eastside its character are on either side of the Kukui Highway near the Coconut Grove Shopping Mall. The historic Waipouli coconut grove (pictured above) is just north of Courtyard Marriott, and is over 90-years old. This is the last part of the coastline with an original stand of coconuts on it. The grove is on the "Exceptional Tree" list, protected by Kauai County Ordinance. Coconut Plantation Village, a proposed development may be sited here. The developer is making efforts to preserve as many of the trees as possible. Of the 287 existing trees, 114 are deemed healthy for transplanting. The lifespan of coconut palms is around 100-years. The SMA permit application includes an evaluation of each individual tree. If the land is developed, there will be efforts to protect those trees that remain afterward. But Kauai's Royal Coconut Coast will likely not live up to its name.